Anda Mancas, owner of Ai Sushi Bar, has opened a hip place where people can enjoy not only sushi, but many other types of delicious foods and a great selection of brews in a laid back atmosphere with friendly and smart staff. How and why did she bring Japanese synergies to the Romanian market? OZB found out. Why did you decide to pursue a career in the restaurant business? Since I was a child, my favourite game was one invented by me and my best friend, it was cold “grocery”. That meant I had a table and a chair on the street and I sold chewing gum, candies, juices etc. all bought from the shop around the corner and sold with an increased price. At around 8 years old, I was selling newspapers to drivers waiting at traffic lights. This was the beginning. Later on, I learned that a business must have some principles of management. However, by the time the global financial crisis hit, I had already failed at two businesses, so there was clearly something I was doing wrong and that was the fact that I didn’t enjoyed either of my earlier businesses. When I was focusing on what I enjoyed, all my thoughts lead to hospitality. I’ve read that luck is the moment when training meets chance and this is what happened to me. As in any other business, a manager has to take care of sales, marketing, PR, human resources, acquisitions, administration, finance, legal proceedings and all the bureaucracy. The most pleasant responsibility: when I get to spend time with “customers” that are my actually friends or later became friends. The fun part also involves testing food, drinks, playing music, entertaining myself and others. What’s your secret to keeping customers coming back? Probably being present at Ai every day counts a lot. It counts because I hear all the suggestions, all their inquiries, all the complaints, I am trying my best to keep the quality the same as from day zero, I pay attention to my colleagues and I try to improve their skills, I see the atmosphere and change it if something doesn’t feel right, I always listen to people’s advice and when I do something new, I am always trying to get different perspectives. A plus might also be that the Ai team hasn’t suffered too many changes so my colleagues have good connections with our customers they have also become friends with all the people that step in and probably that helps our customers felt like it’s their comfy place. Finding the perfect location, “pray” for the owner of the place to accept your changes, come up with a good name, open it with a very low budget etc. When it starts working, new challenges arise: you hope that the owner of the place will not kick you out or modify the contract, I hope I will not have to move out courtesy of new legislation, as has already happened to me. But currently my biggest challenge is to keep on doing a good job. Be present, come up with new ideas, keep the team, the quality and the atmosphere. 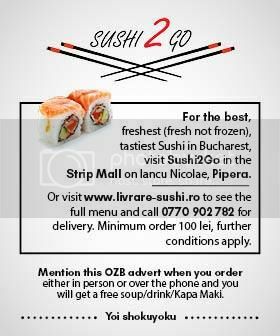 Ai Sushi Bar, 71 Paris Street, daily opened from 08.00 AM – 01.00 AM.